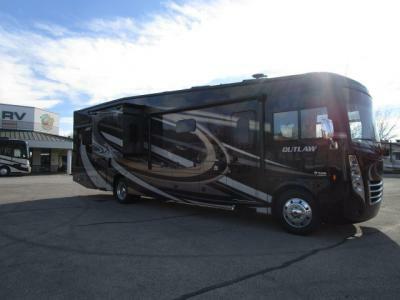 With an RV like this Outlaw class A motorhome toy hauler, you will be jumping at any chance you have to take your next big excursion. This model includes all of the comforts of home and then some with accessories like the four LED TVs located in the garage, the bedroom, the living room, and along the exterior wall. Even the kitchen has been fully decked out with an 11 cu. ft. double-door refrigerator and a 2-burner electric induction cooktop to resemble the kitchen you love at home. 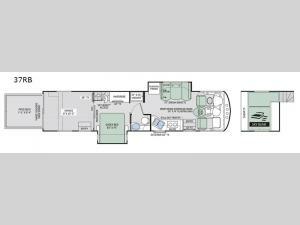 With fun amenities like the sky bunk and cab-over bunk, this unit is able to sleep eight people, and the 127 cu. ft. exterior storage space is able to accommodate all of the items that come along with those people. 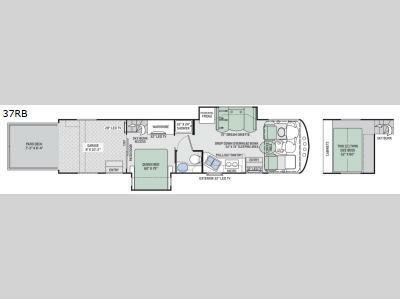 Thor Motor Coach has designed this Outlaw class A motorhome toy hauler to be able to accommodate all of your storage needs with amenities like the basement pass-through storage. The large, separate garage allows you to tow along all of your outdoor accessories, such as bicycles, kayaks, and ATVs, without having to maneuver around them while you live your life in the main coach area. The patio deck that extends out of this garage is a wonderful addition for an extra grilling or lounging area because of the included patio awnings and bug screen curtains. The automatic power entry steps make it easy for anyone to enter and exit this unit, and the entry door deadbolt lock makes it so that only the correct people do just that. 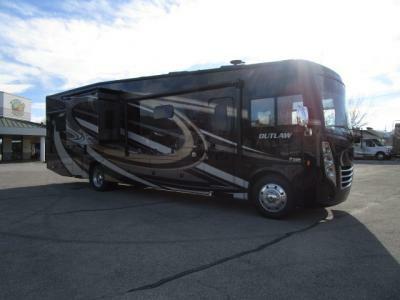 So, come choose the best Thor Motor Coach Outlaw class A motorhome toy hauler for you from out "wanted list"!